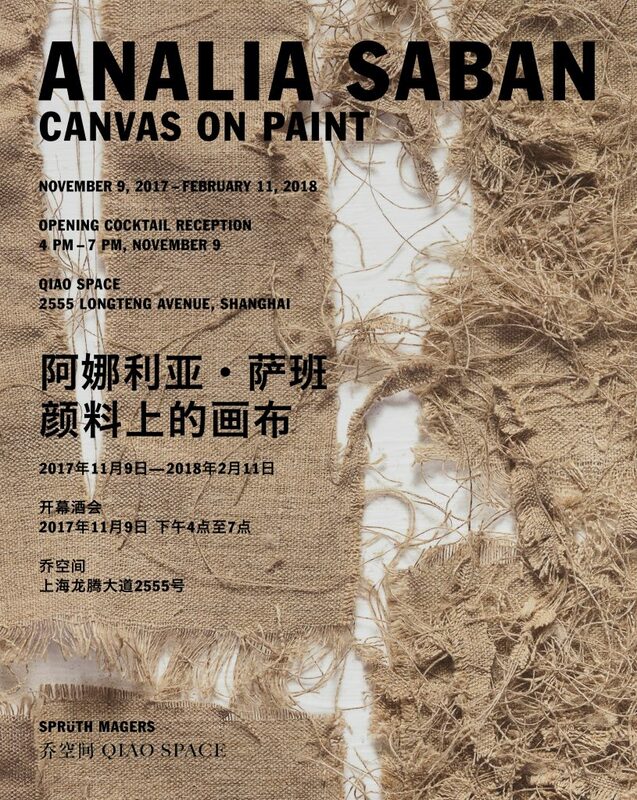 Qiao Space, in cooperation with Sprüth Magers, is pleased to present Analia Saban’s first show in China. The exhibition Canvas on Paint furthers the artist’s experimental, witty, and profound exploration into the genesis of artworks and the ways they engage with their surroundings. Across two recent series, Saban weaves together literally, at times medium, content and architectural references into everyday concerns that range from playful investigations to meditations on mortality. Saban’s new series continues her long-held occupation with the basic tools of art-making; while using traditional materials such as paint, linen, and paper, she frustrates our concept of what a painting, sculpture or drawing can be. In Saban’s series of weavings each painting has been woven by hand on a traditional loom. The canvases are constructed by knitting networks of dried acrylic brushstrokes together with fibres of linen. The monochromatic lines and forms that run through these works share the minimalist impulses of painters such as Sol Lewitt and Agnes Martin. However, they also subvert received notions of painting as strictly paint-on-canvas, by mastering what is essentially paint-within-a-canvas. The resulting objects are situated somewhere in between painting and sculpture. The geometric patterns within the works gradually consolidate into recognizable forms, such as a line, a grid, or a square that are frequently seen both in art and architecture. What begins as an innovative subversion of artistic conventions develops into an exploration of the permeable boundaries between artworks, objects, architecture, and daily life. A recent series of photographic inkjet prints in the exhibition contests ideas of how art mediums are understood to function. We observe the gradual unravelling of a linen canvas, its threads are unwoven by an unseen hand. The photographs look uncannily real, tempting viewers to reach out to pull the loose strands themselves. They are printed onto carefully prepared sheets of acrylic paint, which are created by drying thin layers of white paint, building them up over time until they are dense enough to support the printing process. Analia Saban (b.1980 Buenos Aires, Argentina) lives and works in Los Angeles, CA. Saban received a BFA in Visual Arts from Loyola University in New Orleans in 2001, followed by an MFA in New Genres at the University of California in Los Angeles in 2005. Her work has been exhibited widely in both solo and group shows in the US and Europe, including two concurrent exhibitions at Sprüth Magers in Berlin and Los Angeles (2017); Blaffer Art Museum, Houston (2016), Rubell Family Collection Contemporary Art Foundation, Miami (2015-2016), LACMA, Los Angeles (2012, 2014-2016), The National Museum, Oslo (2014-2015), Kiosk, Ghent (2015), Armory Center for the Arts, Pasadena (2014), Palais de Tokyo, Paris (2013), and Centre d’art Contemporain de Fribourg, Switzerland (2012-2013). 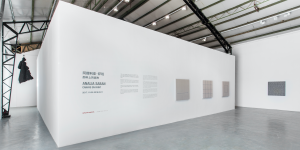 Furthermore, Saban’s works are represented in the collections of the Hammer Museum at UCLA, Museum of Contemporary Art, and Los Angeles County Museum of Art in Los Angeles; Centre Pompidou in Paris, and Fundación Proa in Buenos Aires, amongst others.